This may seem like a wild idea, but when it comes to corporate innovation, there is one industry that stands head and shoulders above the rest; the pizza industry. Earlier this week it was announced that Dominos, the famous worldwide pizza chain, was going to be trying out a sponsored lens in Snapchat that would let people take pictures and videos with an augmented reality pizza. While sponsored Snapchat lenses are quite common these days, this one would be different as it would also have an onscreen button that Snapchat users can press to order a real pizza directly through the social app. This sounds like a fun brand stunt (and it totally is), but it is also part of a larger trend that many people don’t realize exists; the pizza industry is leading the way when it comes to testing new technology and creating innovative new ways for their customers to get pizza. I’ve personally noticed that pizza companies, especially the larger chains, are often some of the first companies to adopt new technologies so that they can make it easier and more convenient to order pizza. It started back in 2008 when Domino’s unveiled their Pizza Tracker. 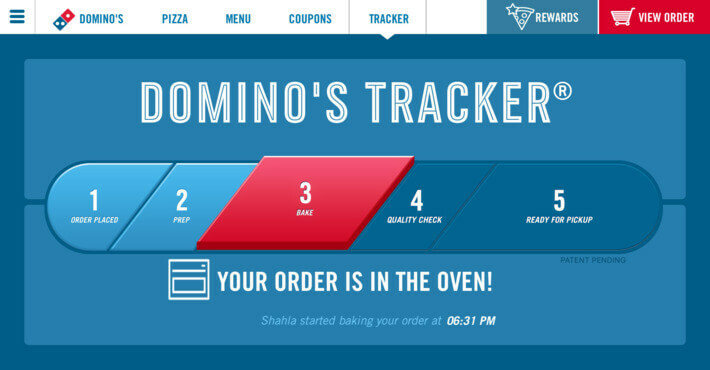 At the time, the pizza tracker was an innovative way for people who were ordering their pizza online to watch, in real-time, where their pizza was and how soon would it would get to them. This seems like a no-brainer for restaurants that deliver, or companies like Uber Eats that lets you track where your food is in real-time. But when Dominos first introduced the idea in 2008, no one was doing it. They were the innovators and then everyone learned from them. But just knowing where your pizza is, is not the only convenience innovation the pizza industry has made. You may have noticed a fancy looking car in that commercial above. That car is not just a regular car with some Domino’s logos slapped on it. It’s actually a DXP, a specially tricked out Chevrolet Spark that has room to keep pizzas hot while they get delivered to you. The car was a collaboration with Chevrolet and took 4 years for them to make before 100 of them actually hit the road in 2015. And that wasn’t the only innovation the company rolled out in 2015. That same year, the Oxford Dictionary named the ‘Face with Tears of Joy’ the word of the year because emojis were taking over the way people spoke. Of course, Domino’s noticed this and came up with a way for customers to order a pizza by simply tweeting a pizza emoji to them. While Domino’s is definitely a leader in the space, they aren’t the only pizza company that is using innovative ideas and technology to make buying, making, and delivering pizza easier for everyone involved. Earlier this year at CES, Pizza Hut teamed up with Toyota to unveil the world’s first autonomous delivery vehicle, a strange looking truck that can roll around your town while making fresh pizzas while it drives to your house and keeps them warm (in case the pizza is ready before the vehicle gets to your door). So, what can we learn from all this pizza talk? Companies innovate to improve the way we do things. They can make things faster, more convenient, or even just keep us placated and not freaking out wondering where our delivery food is. Companies that understand that they can use technology to make lives better, or find better ways to do things, need to first play around and explore these ideas. Whether they go somewhere and stick around forever, like a pizza tracker, or are just a limited time trial, like drone delivery pizza, the key is to play with and test these ideas. The more you test ideas, the more winning ones you’ll have to lead your company into the future. Even if you just make pizza, there’s real value in allowing your company to keep trying and testing innovative ideas.